The best thing about today’s reboot-happy culture is that none of us ever really need to grow up and move on from the things we liked as children, and nothing has ever illustrated that more clearly than Nickelodeon announcing today that it’s bringing back Rugrats. In a press release, the network announced that it’s reviving the classic baby cartoon for a new, 26-episode season and a “live-action film featuring CGI characters”—which we have a number of questions about, but we’ll get back to that. 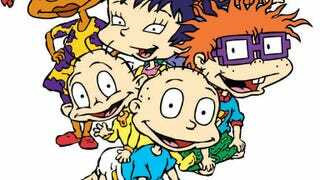 As for the movie, we’re just a little anxious about how Rugrats could be a “live-action film featuring CGI characters.” Will CG versions of the Rugrats characters be interacting with real live humans? Because as much affection as we have for these stinky babies, that sounds horrifying. Or will all of the characters be CG and, say, Spike the dog is played by a real dog? Because that seems kind of silly. Also, will Phil and Lil be there? And can the movie just be a feature-length adaptation of “Big People,” the best Rugrats episode ever made? Anyway, the movie is being written by David Goodman and will be in theaters on November 13, 2020, so make sure to have already voted when you go see it.